WASHINGTON (Feb. 09, 2014) -- Advancements in medical and weapons technology, developed by science, technology, engineering, and mathematics professionals, help the Army win wars and save lives, said the service's vice chief of staff. At this year's 9th Annual Stars and Stripes recognition dinner, part of the 2014 Black Engineer of the Year STEM conference, Friday, in Washington, D.C., Vice Chief of Staff of the Army Gen. John F. Campbell served as the keynote speaker and presenter for two awards to both uniformed and Senior Executive Service African-American engineers. At this year's 9th Annual Stars and Stripes recognition dinner, part of the 2014 Black Engineer of the Year STEM conference, Feb. 7, 2014, in Washington, D.C., Vice Chief of Staff of the Army Gen. John F. Campbell served as the keynote speaker and presenter for two awards to both uniformed and Senior Executive Service African-American engineers. STEM refers to science, technology, engineering, and mathematics. Brig. Gen. C. David Turner, commander, South Pacific Division, U.S. Army Corps of Engineers, earned the award for Army general officer. Alvin D. Thornton, director of the engineering directorate, Edgewood Chemical Biological Center, U.S. Army Research, Development, and Engineering Command, earned the civilian award. The 2014 Non-Commissioned Officer award went to Sgt. 1st Class Milvia Mae Kendrick, and was presented by Sgt. Maj. of the Army Raymond F. Chandler III. 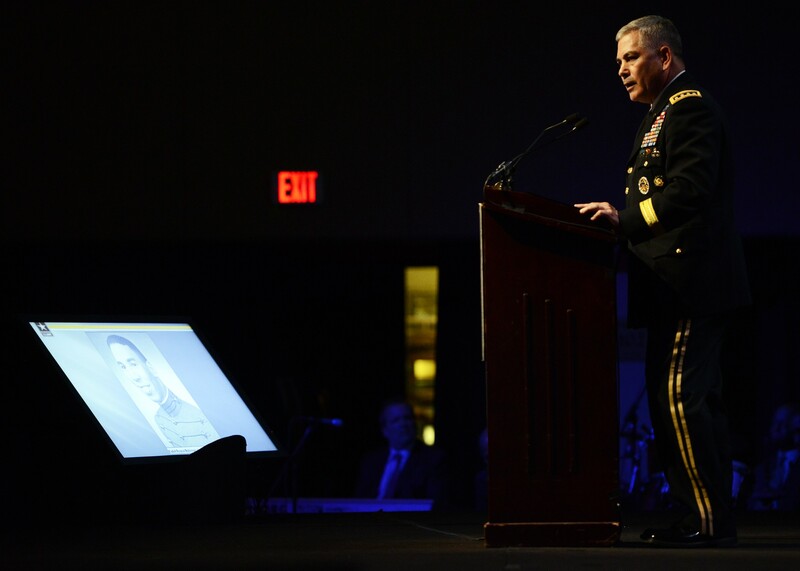 Addressing an audience of about 400 BEYA conference attendees, Campbell highlighted an Army officer who broke boundaries by becoming the first African-American four-star general. Gen. Roscoe Robinson was a 1951 graduate of the U.S. Military Academy at West Point, N.Y., and served in the Army from 1951 through 1985. He was an engineer. "For 35 years, during one of the most important eras for race relations in our country's history -- he fought in Korea, he fought in Vietnam. As a lieutenant, he served as a platoon leader in a segregated, all-black unit, in a time when black men could not serve in positions of authority over white men," Campbell said. "Through perseverance, determination, and a strong educational foundation, he went on to become the Army's first African-American four-star general." Campbell used Robinson as a launching point to highlight the difficulty the Army has in attracting minorities, and minorities with STEM educations. He said in the United States, the percentage of engineering graduates is below five percent. China, he said, graduates STEM professionals at about 31 percent. "Add to this that only five percent of our engineers are African-American or Hispanic, and the talent pool that merits our focus at events like this becomes even more clear," Campbell said. But Campbell told attendees that the Army is a competitive employer for STEM professionals. The service offers scholarships, is on the cutting edge of technology, and "can guarantee a job for any hardworking individual, and potential for advancement." "STEM expertise is fundamental to our ability to defend our nation," he said. "BEYA provides a forum where leaders in the public and private sector come together to inspire and develop current and future generation STEM professionals." Campbell said the Army has several avenues to reach out to youth, including an emphasis on minority youth, to inspire them to pursue STEM career fields. A workshop in Atlanta, led by engineering students from the West Point, and sponsored by the Atlanta West Point Society, exposes local youth to Army programs for those interested in STEM career fields, he said. "These efforts to educate are having an effect." The Army's Reserve Officer Training Corps program is also among leading sponsors of college education in the United States. The Army, he said, provides $240 million in scholarships to about 13,000 students at over 1,000 schools, including 23 historically black schools. And the Army Educational Outreach program works across the country to provide STEM education opportunities to schools representing all social and economic backgrounds. In room full of engineers, some of whom may be responsible for designing and manufacturing technology used by Soldiers, Campbell said that after leading Solders in combat, he knows they trust the equipment they are issued to both let them win, and to protect them from enemy attacks. "When Soldiers lob rounds on target, they trust they can call on an M777 Howitzer with Excalibur rounds to give them the precision fire they need within two meters," he said. "When Soldiers believe there might be an improvised explosive device, they trust they can see the enemy emplace it during the day or night with their Gray Eagle unmanned aerial vehicle, with their hand-launched Puma [unmanned aerial vehicles], or with their JLENS aerostat with over-the-horizon cameras. They trust that they can jam the [improvised explosive device] with their man-packable four-frequency jammers, or detect it with their ... ground penetrating radar and metal detectors." And if they do get hit with an improvised explosive device, or IED, he said, Soldiers are protected "with the best body armor, and best vehicles in the world." He said mine-resistant ambush-protected vehicles, known as MRAPs, for instance, and the double-V hull Strykers have decreased casualties by 30 percent in Iraq and Afghanistan. In December 2007, he said, 1,300 MRAPs were being produced every single month. And the design, acquisition and fielding of the double-V hull Stryker took just 18 months. "If we put our minds to it, this nation can do anything we want," the general said. Even more than weapons, he said, medical advancements build trust among service members, "inspiring confidence in the all-volunteer force -- that we have their back when we go to war." Studies from Vietnam and Somalia, he said, show that as many as 70 percent of battlefield deaths are the result of bleeding in the arms and legs. Medical engineering advancements such as the combat application tourniquet, and hemostatic dressings have addressed that. He also said within 72 hours of injury, Soldiers can be home in the United States getting medical treatment. Prosthetic technology, the product of advanced medical engineering research has greatly improved the ability of Soldiers to function after losing a limb. Prior to 2001, he said, prosthetic arms could perform two or three functions, such as turning a wrist or moving a hand -- but not simultaneously. Today, he said, prosthetics can perform 29 discrete motions using neural signals from the brain. "The latest technology allows an above-the-elbow amputee to pick up a grape and eat it," he said. A major initiative for the Army, in the face of two wars in Iraq and Afghanistan, has been research into traumatic brain injury, known as TBI, and post-traumatic stress disorder. Campbell said the Army Medical Research and Material Command is now managing the largest TBI research investment in world, and has established a partnership with the National Football League, General Electric, and UnderArmor. They've "launched a $60 million research effort to accelerate brain injury detection and prevention," he said. For evaluating the potential of TBI in Soldiers, he said, "engineers have designed the blast gauges that Solders wear on their kit that enable medics to accurately identify those at risk for TBI after an explosion. And, doctors and engineers are designing pen-sized testing devices that can draw a Solder's or football player's blood immediately after an incident and test the sample for blood-based biomarkers for brain injury. What better way to maintain the trust of your Soldiers, Sailors, Airmen and Marines than to provide the best medical care in the world?" The Army has great technology today, Campbell said. But it will need the best technology for the future too, including micro-UAVs, "Ironman-like" exoskeletons for Soldiers "that enhance their ability not only to run farther, and carry more, but monitor their vital signs, rapidly close wounds, and stop bullets." He said kinetic weapons today, like the Phalanx close-in weapon system can stop incoming artillery, rockets and mortars. For the future, he said, it might be directed energy weapons, or lasers that perform that function. He called on those in the audience to make it happen. "For the students in the audience, for our academic leaders in the audience, this is exactly what we need for you all to continue to build upon to keep our nation on top," Campbell said. "I trust beyond expectation that the group gathered here tonight will continue to lead the military and American society, in the fight for diversity, equal opportunity for all who choose to serve." The Stars and Stripes recognition dinner is not associated with the Stars and Stripes news service.